Hemingway and I have always had a bit of an unstable relationship, mostly because I just can never seem to click with his stories or the way he writes them. My first Hemingway novel was A Farewell to Arms, which I read last year with my American Literature class. Not only did I not enjoy the subject matter itself (WWI in Italy and various other European countries) but the writing style was so dry, bland, and emotionally unattached. Even though I knew that his writing style was one of Hemingway’s claim to fame, I thought that perhaps it would be a bit different in another novel of his. With this more open mindset I embarked on reading The Sun Also Rises, but I quickly realized that this reading experience would be incredibly similar to the last one. 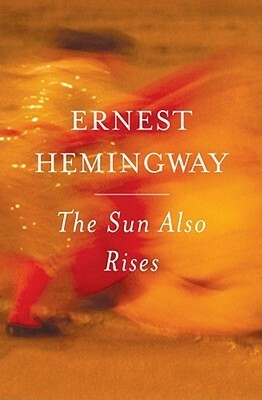 One element Hemingway’s novels seems to always be a constant: his writing style. His sentences are very short and choppy, lacking the flowery descriptions that I often appreciate from other authors. It includes a lot of random and mundane dialogue, much of which I could completely do without and I don’t think it would detract much from the story overall. While reading this novel I felt as though I was reading a word-for-word description of someone’s daily life, and it became really dull, really quickly. For example, dialogue would often consist of a two people going back and forth, saying only a few simple words at a time. I do admit that this is more realistic than most fictional conversations, however it was very boring to read about. Perhaps I’m going into this novel expecting to be entertained when in actuality the goal of it is very different. Just as the subject of A Farewell to Arms did not spark my interest, the story itself of The Sun Also Rises was not intriguing enough to keep me eagerly turning the pages. Not much seemed to happen in regard to the actual plot, and in general I found it to be boring and tedious to read. Most of the action that takes place is drinking, arguing, and watching bullfights, all of which are not terribly interesting. I understand that he’s writing about the Lost Generation, and therefore it makes sense that the characters are sort of aimless and feeling like they have no concrete purpose to their lives. However, I wish there had been some clear motivator that directed the action and resulted in an obvious cause and effect motion. Maybe that beginning push does exist in this novel and I simply didn’t understand it, and if that’s the case then I would gladly reread it again with a new perspective. The real reason I kept reading this book was to see what happened to the characters, many of whom I disliked. For me the most interesting aspect of this book were the character dynamics. They all had complicated relationships with each other, and it reminded me of how complex friendships can be in real life. Take Jake and Brett, for instance: Jake is in love with Brett, but Brett only cares about chasing other men. Brett seems to have a tumultuous past- all the characters do, really- and I’m assuming that it has something to do with the way she constantly needs to be involved with a man. At the same time, she exudes an aura of independence, suggesting that although she prefers to be in romantic relationships she could surely take care of herself if the need arose. I think it was wrong of her to lead Jake on, but at the same time I believe that Jake should have just moved on to another woman. Due to the balance of their good and bad qualities I was rather indifferent toward Jake and Brett, but I hated Robert Cohn. He made me so angry that I just wanted to punch him (and I cheered when one of the characters finally did!). I have no respect for self-centered, arrogant, and cruel people in real life, and therefore I had no tolerance for Cohn. Overall, my experience reading The Sun Also Rises mirrored my experience of reading A Farewell to Arms last year. Both books were not very entertaining or interesting to me, which may be because this particular time period is not one of my favorites. I really wanted to give Hemingway another chance, but I think that without further education on his life or his novels my opinions will remain the same. I do think that if I read any of his books in a classroom setting with a lot of historical background discussed then I may actually enjoy his books. When I finish reading them I always feel as though I’ve missed something important, like a significant symbol or metaphor that would change my perception of the story. Hopefully I’ll be able to have a more positive experience with a Hemingway novel in the future, as I would love to enjoy the writing of such an influential writer. Would I recommend it to a friend? : Only if I knew they enjoyed Hemingway’s other novels or were particularly interested in post-WWI or the Lost Generation. Otherwise, I would probably suggest something like F. Scott Fitzgerald’s The Great Gatsby, since that focuses on a similar time in a different part of the world. Have you read this novel? What did you think of it? Are there any works by Hemingway that you would recommend? Let me know in the comments section below! I totally agree with you! I just read about half of this book and then All The Light We Cannot See became available for download at the library (I’m only 25% through and it’s PHENOMENAL!) so I stopped. Reading The Sun Also Rises kind of felt like watching an episode of Mad Men. It was really good, but nothing was really happening. It felt like a friend was just telling me a story about a trip they had. I plan to finish it after All The Light We Cannot See, so I’ll let you know if I change my perspective 🙂 Appreciate the honest review!